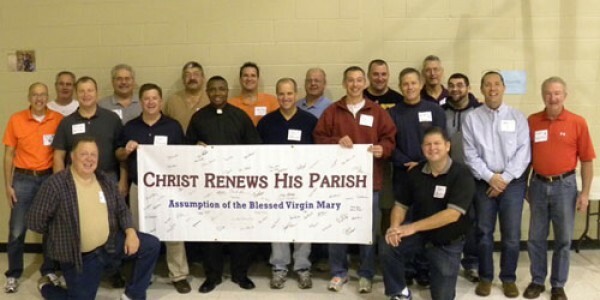 Christ Renews His Parish is a Christ centered program designed to bring members of a parish together in His name. With Christ in the lead, our journey follows a purposeful path and results in a truly spiritual experience. 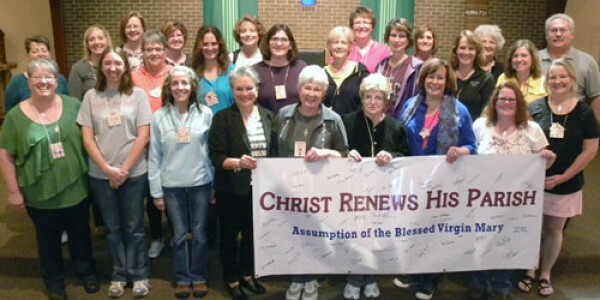 All members of the Assumption parish will enjoy and benefit from the CRHP weekend. The renewal weekend is designed to give both the individual and the parish community an opportunity for renewal and growth in spiritual life. As we grow in awareness of God’s love and respond to His call, we grow together as a parish family. Parishioners at Holy Family parish in Cleveland held the first renewal weekend in 1969. They were overwhelmed with the enthusiasm and positive response from parish participants following their initial weekend. The CRHP process helped their faith community understand in a new and more alive way that Jesus Christ was its center. Now, some 45 years later, Christ Renews His Parish has been initiated in over 1,200 parishes in 90 dioceses and in 35 states. Be prepared to have fun, renew and share your passion for Christ, your Faith and your Parish. Participate in small group discussions and activities on a variety of topics. Meet new friends in the parish. Be free to participate as much or as little as you feel comfortable. The weekend is for you. The weekend is absolutely FREE to Assumption parishioners. All meals, refreshments and simple accommodations are included. Registration is required. Please complete the form below. Yes, I am attending the weekend! Please list any special physical or dietary requirements below. We will make every effort to accommodate these requests. List up to three people you would like to pray for you and please include their phone numbers.